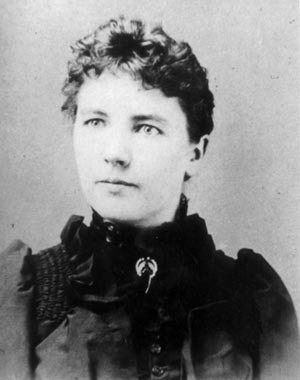 In the first of her “Little House” series Laura Ingalls Wilder describes in charming detail her early childhood in a log cabin in 1870s Wisconsin. Her parents work very hard to provide for their three little girls, and all sorts of pioneer activities are described – churning butter, hunting and trapping, making maple syrup, smoking meat, braiding straw hats, threshing grain, etc. Their life is fairly isolated in the woods, highlighted by visits from relatives, a community dance at her grandparents’ house, and Laura’s momentous first trip into town. Through all their adventures Laura is wide-eyed and observant, if a little timid. The girls are extremely responsible and well-behaved, and their parents are fairly strict, though Pa more often than not gently lectures rather than reaching for the strap. Along with daily chores, there are many thrilling and amusing events recounted in this book… a chance encounter with a cow who turns out to be a bear and another encounter with a bear who turns out not to be a bear, a misbehaving cousin who is stung by wasps, a lively Christmas Eve, and many winter nights by the fire with Pa playing his fiddle. All in all this is a marvellous historical record, written down faithfully by someone who was actually there. It is also a simply written, simply told tale, and wouldn’t be too hard for a new reader to tackle. Such detail about everyday life makes it easy for even a small child to imagine what life was like for Laura and her sisters. The main messages revolve around how hard everyone works, pitching in and working together, and how their activities are linked to nature around them – the seasons, the planting cycle, and animal behaviour. It’s also a portrait of a rather gentle, loving family. There isn’t a lot of misbehaving here, and it’s clear that children were not allowed to get away with much back then. The only bit of strife is a slight current of jealousy which Laura harbours for her older sister Mary – she of the golden curls – but Pa always has a kind word for his middle child and hard feelings are quickly forgotten. This is a family that is kind, generous and sensitive to the feelings of all its members. There is no mention made of real hardship, as the Ingalls seem to be doing quite well in the wilderness. As well, there is no mention made of conflict between settlers and natives, and the Civil War is only mentioned in passing. For a broader view of the time, see Caddie Woodlawn, which takes a look at bigger issues such as violence, racism, war and the distant assassination of President Lincoln. This would be a terrific follow-up book for slightly older readers, as Caddie is far more of an independent thinker than little Laura, and much more prone to getting into trouble. Little House in the Big Woods… (anaturemom.com) – proof positive that it’s a good read for boys too! Previous Holes Next Our Little Artists – Why Should They Have All the Fun?